When you’re running a business, you may be personally liable for any actual or alleged breaches of the Corporations Act. And it’s not just large companies that are exposed – small and medium business owners and officers could be at risk as well. Penalties awarded against companies and their directors or officers for work health safety breaches have increased by 43% to $22.3 million in one year. Penalties now average $62,000 per company according to the Safe Work Australia, Key Work Health Safety Statistics 2014. Property damage or bodily injury. A former employee claims they were wrongfully dismissed from your business because they were unwell at the time their position was terminated. They want to be reinstated to their role and remunerated for their loss of income while they were out of work. After numerous unsuccessful conciliation attempts, the matter is brought before a court and you have to pay damages to your former employee. A Management Liability policy allows you to recover some or all of these costs so you can continue to run your business without having to sell your business or personal assets. 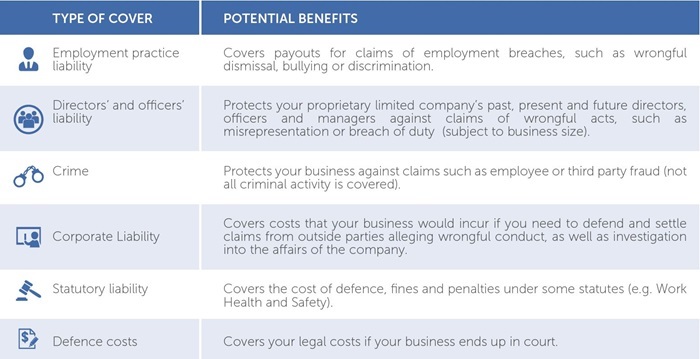 Depending on your policy, you may be able to make a claim for your defense legal costs, as well as the amount paid to your former employee.